I am a dance teacher and have been experiencing pain in my sacro-iliac joint on my left side. I figure it may be due to my demonstrating most exercises with my right leg and being supported on the left. I have been to a chiropractor who helped me isolate the problem, but none of the treatments really helped ease the pain. The next step they recommend is to have an MRI done. Is there anything else I could try or anyone I should see before going through that expense? I’m finding that the pain is getting worse, and all I can figure to do is to ice it during the day. Just as an added bit of info: I started carrying my bag on a cart this week instead of on my shoulder, and for the first time in a while, when I got out of bed this morning, I didn’t notice the usual pain in my back. Maybe some connection? Lisa, carrying a bag on your shoulder most likely didn’t cause the pain – but it may have been exacerbating it! I’ve seen really interesting connections between movement patterns and shoes, purses, backpacks, bags, you name it:) The challenge with carrying a bag (I’m envisioning a dance bag that hasyour day packed inside of it) is the shift it creates between the torso and the pelvis. Let’s say that you have it slung over your right shoulder or even crossed from your left shoulder to the right hip – automatically the pelvis shifts to accommodate the extra bulk. (See image on the right and imagine a bag hanging on the right side of his hip.) Do you see how the left side of the lower back and pelvis is crunched up? In the short clip below from Essential Anatomy: A Multimedia Course – I demonstrate how to check for a torqued pelvis. Since I’ve taken this clip out of sequence let me explain that if you feel the bones at the front of the pelvis those points are your ASIS. Ideally those 2 points of the pelvis should be even with each other. When you have a torque, one ASIS will be lower towards your knees (generally on the side where you feel the discomfort in the back). It’s as if one side of the pelvis is being draw forward and down. The torque happens at the sacroiliac joint and can cause pain. The side that has the ASIS that is lower (in the clip the right side of the pelvis) will have more limited hip flexion. 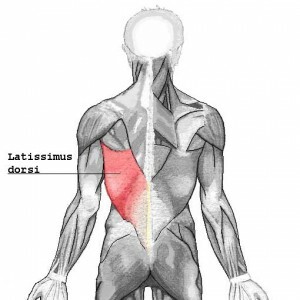 Sometimes stretching the hip flexors will help to reduce the torque on the pelvis, and often I do a triggerpoint release to the iliacus muscle, which can help a lot. I do teach dancers to release their iliacus triggerpoint themselves, but that is beyond the scope of a blog post. I would encourage you to ask a physical therapist or the chiropractor if they can see if the triggerpoint is sore and how to release it. Generally, when the release of the iliacus is succesful, the ASIS are even and you can bring your knee more easily towards your chest. When there has been chronic inflammation or strain in an area it can take some time to calm down – but you will know you are on the right path – because it feels better! Thank you so much for all the information you provide on your web site and in Tune Up Your Turnout! Since I have a sway back, it was a nice surprise to buy a book about turnout and also get so much help with alignment. After stretching the hip flexors (it’s like a miracle!) I can now lay on the floor with both legs straight and much less arch in my back, but only if my shoulders are forward (my whole spine is on the ground but the sides of my shoulders are up off the ground a little bit). If I press the shoulders down to the ground, the huge arch comes back. Is that a problem, and is there anything I can do to improve? I know it’s going to take a while to get my alignment figured out, since the sway back has been there for years and I’ve only been doing ballet for a few months. I just want to make sure I’m doing the best I can and not putting any strain on the wrong muscles. 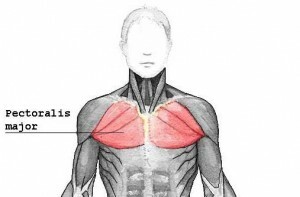 Sounds like you might have a problem with your lat muscles or the muscles on the front of the chest, the pecs. Either of those will draw your shoulders forward in the way you described. Try this…. lie down on the floor as you described and get a sense of how much your back arches when you press the shoulders down. Then go a doorway and stand in the doorway with your right arm bent at a right angle and placed against the door frame. (Your hand to your elbow will be on the wall or door frame) Gently press your arm against the wall while you turn towards the left slowly. You’ll feel a stretch in the front of the chest on the right side. Do the same with the other arm. What did you learn? Did it increase your ability to lie on your back and have your shoulders less rounded forward while keeping your back in good alignment? PS: If you are interested in the Science of Dance Training Summer conference please let me know by March 24th. Thank you! Announcement: Anneliese Burns Wilson has a great offer of a free download for a modern lesson. Check it out at http://www.abcfordance.com/product-p/imd.htm. She also has a free download to a ballet lesson. Anneliese is my co-author for the Functional Anatomy for Dancers series and is a fantastic resource for us all! What does this mean for her dancing? What may I be doing as her teacher to help warm up her body before ballet? What do I need to be careful of? She is doing Cecchetti level 6 work. I’m always so appreciative of teachers who ask questions – and wonder why? It’s those questions that started me on my own path – having students come up and say, my right knee bothers me when I’m doing plié in 5th – why? My left arabesque is higher than my right – why? We know the spine is composed of 3 curves. At the neck and lower back areas the curve goes forward towards the front of the body, and in the chest area it curves towards the back of the body. These curves are essential for shock absorption. I have seen young ballerinas work hard to make their neck absolutely flat. The center of their ear is just behind the middle of their shoulder. Flattening the neck creates a flattening response in the rest of the spine – similarly – flattening the lower back will often create flattening of the curves above it. All bodies, including the prepubescent ballet body, should have curves to it. The buttocks should round slightly behind the lower back. As the x-ray report states, decreasing the curves of the spine will decrease the spaces between the vertebrae. This isn’t good. Warming up before class would focus on releasing tension. Watch her carefully for straining and pushing to put her body ‘in alignment’. Easy spinal swings, relaxing over a physioball (on her back as well as on her stomach) will feel good. I’m assuming that her physician has put her in physical therapy and she has exercises to do to help redevelop the natural curves to the spine. Most of all – be aware of her standing stiffly, pulling her head back and up. The other pattern will be tucking under the pelvis. I’m not sure which end of the spine is more the culprit for her – but I imagine you have some ideas from being her teacher! Having her discomfort decrease will be postive indicators that you are on the right track! Another Podcast from the Science of Dance Training! Lisa Howell and I have recorded another podcast and put it on our own iTune channel! It’s a large file – which is why I can’t post it on my website directly – but please do go and check it out! All the questions we answer are on backs and spines! http://thebodyseries.com/wp-content/uploads/2017/02/bodyseries_logo-1.png 0 0 deborah http://thebodyseries.com/wp-content/uploads/2017/02/bodyseries_logo-1.png deborah2009-03-02 21:48:162009-03-02 21:48:16Another Podcast from the Science of Dance Training! Quick announcement before we get into this week’s question on neck and back pain. I’m so pleased to be able to now offer pinkie balls for sale, 4 for $10! You will find them under products, then click on equipment. Also… it brings me great pleasure to offer Rebecca Dietzel’s A Dancer’s Guide To Healthy Eating! She is an anatomist who specializes in biochemistry. She teaches anatomy and kinesiology for the Ailey/Fordham BFA program as well as counseling dancers in nutrition. In the near future I’ll post a podcast that Rebecca has so generously offered to record – just for the Dancing Smart Website! More details to come. These three curves should be in balance, meaning that when one part curves more or rotates the other areas of the spine respond because they are connected. Now imagine a young dancer who is pulling their chin back and up. I have seen many dancers work to make their spines ‘look’ flat and have that elegant neck that is so desired. You do want the ears over the shoulder and the head balanced easily on top of the neck. You create that by lengthening the whole spine upwards – not – by pulling the chin back. Watch to make sure your young student doesn’t have an erroneous image of what it means to stand up straight and look like a dancer! I always encourage my dancers (and non dancers) to warm up by rotating their spine easily and effortlessly. Spine health is often equated with the ability to rotate, and as I have mentioned in prior posts every time there is a lateral curve of the spine there is rotation. (I have never seen a perfectly straight spine – so we all have some degree of lateral curves). We want to be able to rotate the neck, upper back, and lower back evenly to the right and the left. Your dancer probably is experiencing more discomfort in her lower back area over her neck. The neck is supporting the weight of the head while the pelvis and lower spine carries the weight of everything above it. How well aligned the spine is will determine how it travels through to the legs and how much or little muscular effort is required in standing. The fact that she has narrowed disc spaces in this area as well is confirmation that something is off in her alignment. I’m assuming that her physician has put her into physical therapy where the PT can evaluate any muscular imbalances. You don’t mention whether she is slightly tight muscularly, or more of a loosey-goosey flexible dancer. This will help to determine the type of exercises and stretches that would be most appropriate to bring her alignment back to neutral. This is what physical therapy will focus on. As her teacher, your guidance in having her move in efficient alignment, with just enough muscle effort to create the movement without overworking is invaluable. My intuition tells me she is working too hard – pulling up too hard – and encouraging her to be a little more gentle with herself and her dancing and to enjoy how beautifully her body is moving would be helpful. Until next time…. be well! My ballet teacher has been helping me a lot with my feet because they are my weak spot. She said that I am too strong in the outer part of my feet, instead of being strong in the inside part. She said that I am more prone to injury because of this, and that this is incorrect. I know this is true, especially because my feet are pretty close to flat. I “roll in” my ankle in class and outside of class when just walking around. I try not to roll in as best as I can. I was wondering if there are any exercises to help strengthen my inner part of my foot. PS: I have a theraband. Rachel, I’m not sure what you mean exactly with the stronger outer part versus inner part of your foot. When your foot rolls in it is called pronation and yes, there are definitely exercises you can do to help strengthen the muscles of the feet. Your first focus is to bring your turnout in to where you feel equal weight between the pads of the big toe, little toe and heel. Check how you are standing when you are waiting in line at lunch – or standing and brushing your teeth. The habit of pronation probably occurs in your regular life as well as in ballet class. Start with rolling for a moment or two on a tennis ball or pinkie ball to release and relax the foot muscles. Start by simply by ‘playing the piano’ with your toes. Keeping the pads of the toes on the floor, lift the toes up in the air and starting with your little toe, put it down on the ground, then the 4th toe, etc., with the big toe being the last. Now reverse and lift the big toe up, the 2nd toe next, and so on. You can use your hands to help do this exercise. If your feet start to cramp, stop and roll on the ball for a moment. The next exercise is to practice pointing your feet by separating your toes as they begin to lengthen. You will start to cramp on this – and again – stop and roll on the ball before trying it again. You can do this exercise easily with putting the theraband around your toes and pressing gently against the theraband as you extend your toes. Next tip – get rid of your flip-flops! Wear good supportive shoes with an arch support to help you keep from rolling in. Becoming aware of your rolling in or pronating is the first step in changing your feet – and I can’t emphasize enough the importance of standing with equal weight on the 3 points of the foot. I am a faithful reader of your newsletter and I found your book, Tune up your turn out a great help too. Now at 40, I am taking 3 classes a week, I feel that the largest improvement in my dancing would come from understanding of the muscular recruitment of proper posture. I can’t seem to get hold of the right balance between my deep abdominals, hip flexors and extensors. I don’t know if I am tucking under or holding my center. The visual that I got from my teachers is that I should think belly button to the spine, or lengthen from the bottom of my spine, but I don’t find this very helpful. Should I really be aiming for a straight lower back devoid of its natural curve? I naturally stand swayback, in a slight turnout with hyper extended knees. Standing in parallel feels really weird, as if my knees are about to knock, and correcting for the exaggerated lordotic curve I end up on bent legs with tight hip flexors and ribs fanning out. I am experimenting with different recruitments, but I am afraid of acquiring bad postural habits, and I certainly don’t need any more of those. I know that you can’t possibly diagnose my posture by email, but I was hoping that you might have a few tips, or visual images I can try. I know a bit about musculoskeletal anatomy, so to me it would be more useful if someone could address the issue in those terms, as in get out of the quads, use more hip flexors, for example, but this is wishful thinking with the teachers I encountered here. Sounds like you have learned a lot over the past 6 years! 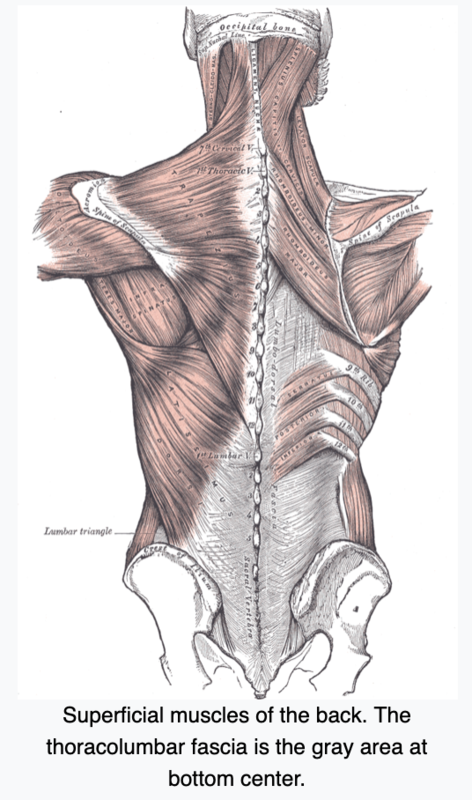 First – check out whether or not your slight hyperextension is connected to your swayback. Very often it is – and when you bring your knees out of hyperextension, the pelvis comes out of its forward or anterior tilt. Note that if you flatten your lower back against the floor your ASIS are probably closer to the floor that your pubic bone, and when you arch your back your pubic bone is closer to the floor that your ASIS. Now come back up to standing. In standing it is more challenging for me to have a sense of the ASIS and pubis relationship so I shift to thinking that my pubis is lifting gently towards my sternum above it. This helps me to maintain the correct torso/pelvis alignment without putting my thinking (and corrections) into my lower back. I also imagine that the pelvis is a bowl and I keep a small amount of lift between the pubis and my belly button in order to keep the front of the bowl from spilling their abdominal contents out as they do when you go into a swayback. Let me know how it goes with bringing your knees to neutral when standing (you can hyperextend when its in the air) and bringing the front of your pelvic bowl up.